Providing a new website for such a large franchise is an honor. 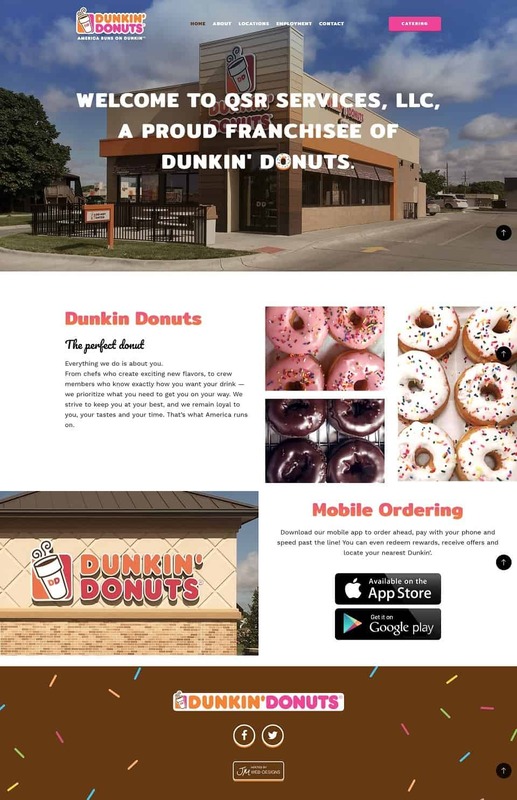 We’re grateful for the opportunity to use our skills and provide Nebraska Dunkin’ Donuts locations with a means to market online. Another repeat customer, Dry Scrubber Users Association, partnered with our Omaha web design team for a second website. DSUA’s website boasts an updated, more simplistic design, as well as a more user-friendly Content Management System. While the previous website was the best technology at the time, DSUA needed a CMS to better fit its needs. So, in selecting a pre-built template design, our Omaha web designers were able to customize the website design and provide a WordPress CMS at an affordable cost. DSUA’s new website also includes a membership tracking tool that grants access to protected pages, a large database of conference papers and a membership directory. Thanks to DSUA for trusting us, again, to build a new website. We’re grateful for the opportunity to partner with our clients for the long-term success of their organizations! development and strong customer service experience, Logan ensures campaigns are on a successful track and customers are cared for. Internet marketing is an ever-changing field; and Logan works with JM’s customers, providing education about evolving technology and new strategies for success. Finding creative and effective ways to help clients build their business in an online marketplace is Logan’s passion and mission. Logan is a Nebraska-native, from Fremont. When he’s not working, Logan enjoys spending time with his girlfriend, Taylor, and their two furbabies (a cat and dog). We’re so grateful to have Logan as part of the JM team, knowing he will provide our customers with excellent insight and incredible support – true to the JM’s tradition of excellence. 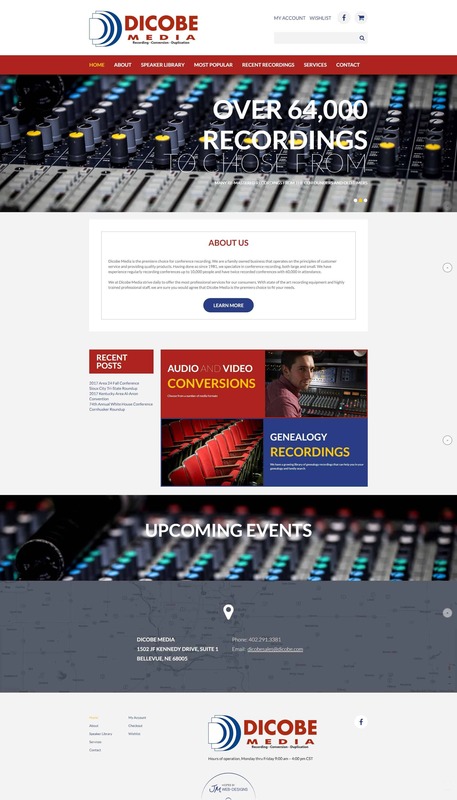 Dicobe Media, is a family-owned company which specializes in conference recordings. Partnering with our Omaha web design company, Dicobe Media now has an ecommerce website, through which it can streamline recording sales. This new ecommerce website is built on WordPress, utilizing a WooCommerce shopping cart. Offering over 62,000 recordings of AA conferences all over the US, this new online shopping cart makes Diacobe Media’s order fulfillment a simpler process. With the ease of WooCommerce management and customization, Diacobe has a user-friendly Content Management System (CMS) through which it can update website content, product information and order information. Our web development team really enjoyed working with Dicobe Media. It’s refreshing to partner with businesses who are passionate about their product and service, and are excited to work with us to take their businesses to the next level. We wish Dicobe the best with its new website. JM has been in business for almost 20 years! Born the same year as Google, we’ve watched the web design and technology industry make huge strides. The only thing that never changes in our industry is… things are always changing. And we don’t expect our customers to keep up with the newest Google algorithm change, the latest browser releases and the best ways to increase online visibility. That’s what our Omaha SEO and web design teams are here to do. So… let us tell you… do not miss the boat on Google marketing. Our Omaha Internet marketing team has seen incredible results repeatedly for our own business, and for many of our customers. We offer professionally managed AdWords campaigns. When managed and monitored appropriately, these incredibly affordable forms of marketing can dramatically increase your exposure and drive traffic to your website. Have you ever searched for something online and seen that particular product or website follow you through various banner advertisements or videos? That is Google Remarketing. Want to pull up faster and higher in Google searches for specific services and products? Then you need Google Pay-Per-Click. For the month of September ONLY, sign up for a full year of our Google marketing services with JM and get one month FREE. Give us a call at 402.292.7500 Option 1 to find out more information and details about our special offer… and allow our Omaha internet marketing specialists to help you increase your website traffic and bring in more leads! JM has the privilege of announcing our second website launch for Palladin Consulting Group, an Omaha-based private investigator service. Many years ago, our Omaha web design team built and launched a custom website design for Palladin Consulting. With changes in technology and new Google algorithm updates, Palladin needed a new website to compete in the online marketplace. This new website is built on a WordPress Content Management system. Not having a CMS in its previous website, Palladin Consulting can now update its own website content and images. In addition to designing this website and formatting the website content, JM also provided a one-time Search Engine Optimization (SEO) for all website pages, migrated the blogs from its previous website for SEO purposes and included a bill pay form with payment integration. We’re always grateful for repeat customers, and thankful that businesses trust us with providing valuable marketing materials.